A pictorial glimpse at my weekend in Aix. Stay tuned ! bisous ! 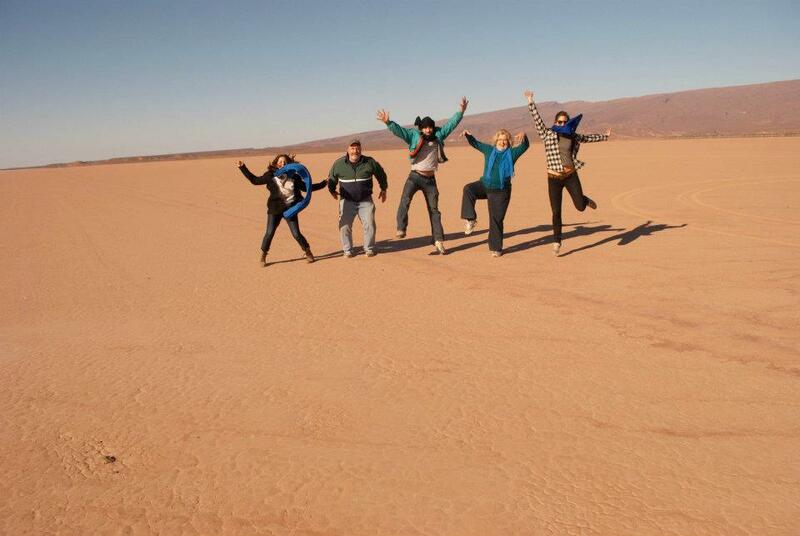 Everyone, Morocco is where it’s at…. I landed in Casablanca Airport on January 16th and traveled that evening to Rabat to settle down in Kaitlin’s apartment. After catching up on the events of our lives during the past three months, we set our minds to planning my 15 day stay. The first stop on our map, coincidentally, was Tarifa, Spain. 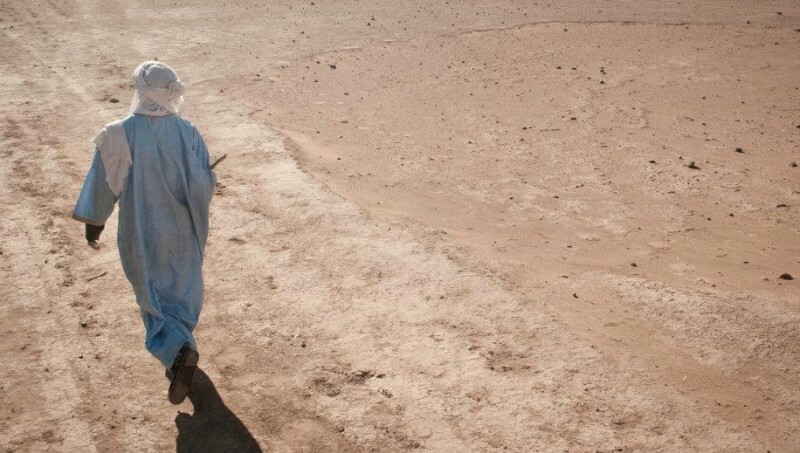 Kaitlin, risking being an illegal immigrant in Morocco, has to leave the country every three months to renew her visa. So we hopped a train to Tangier, took a space ship looking boat across the Strait of Gibraltar and spent four hours in the cute port town of Tarifa. We gorged ourselves on paella and drank a pitcher of Sangria, laughed at our pitiful knowledge of the Spanish language, hit up a local bar for some live music and a few drinks and then to the boat back to Tangier. We spent the night in a beautiful Moroccan riyad, and woke up the next morning in order to make our way to our second destination, Chefchaouen. After a terrifying bus ride up the side of the Rif Mountains, we arrived in Chefchaouen, the most picturesque little town on the face of the earth. 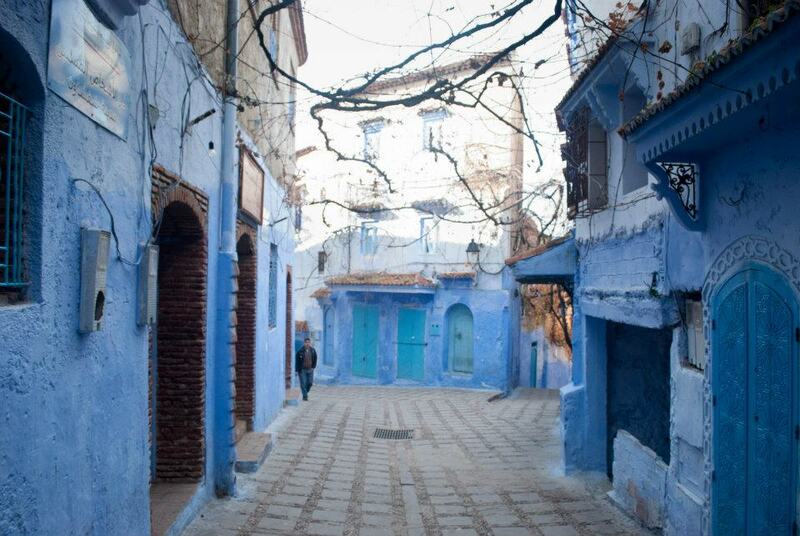 Built into the side of a mountain, Chaouen is known for its beautiful blue medina. The people of Chaouen are the most laid back in the world… perhaps because the town home to Morocco’s leading producer of hashish. We met some characters in Chaouen to say the least. A cool artist who invited us to share a tagine for dinner. We met “Hat Man,” who sits in a little shack all day smoking hash and knitting brightly colored hats, socks, and mittens. We bought up a great deal of his socks to use as stockings for Christmas day. We also bumped into a British man named Simon, whom we’d actually also met in Tangier…small world, and he recounted to us his incredibly original idea for a recipe: 2 tortillas, sprinkled with cheese and spices, grilled in a large pan. AKA a quesadilla. We had a good laugh at his expense. Maybe they don’t eat a lot of “Mexican” food in the U.K. 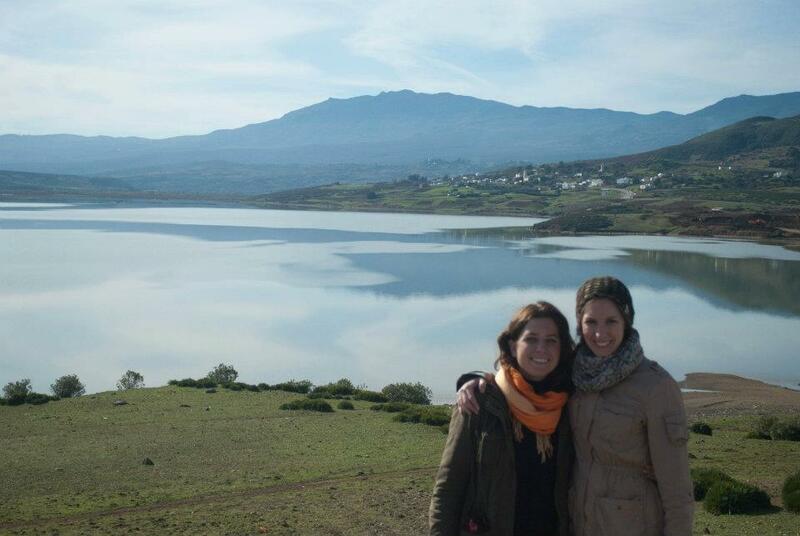 The rest of the time we spent hiking in the Rif Mountains and exploring the little blue enclaves. Chaouen was a dream. We were sad to leave the little blue city, but it was necessary to get back to Rabat to prepare the house for the arrival of Kaitlin’s family. We took an early morning bus to Fez, briefly explored its world class medina and then caught the train back to Rabat. We had an incredibly early morning departure to pick up the fam in Casablanca. As soon as they arrived in Casa we got in a cab and made a 3 hour journey to Marrakech, where we were scheduled to meet our guide to take us on our Saharan desert trek. In order to get to the desert we had to pass through the snow capped Atlas Mountains. Safe in Jamal’s 4X4, we screamed up and around the twisty mountain pass. 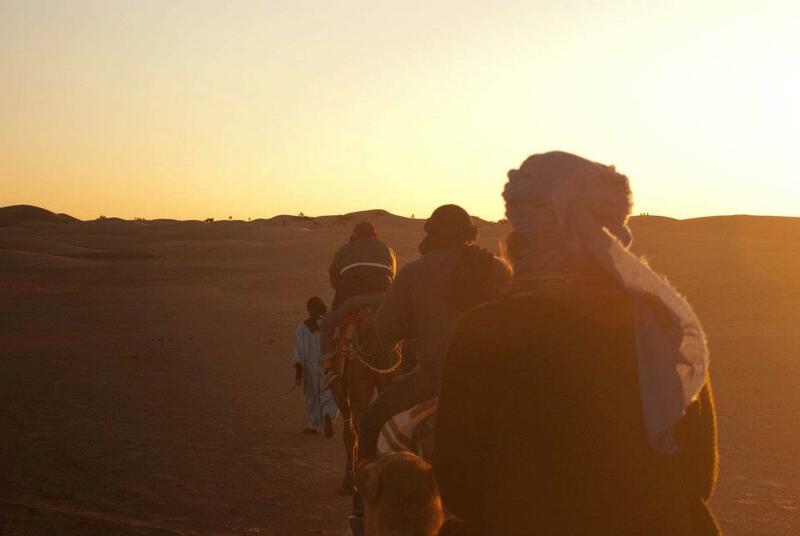 It took a day and a half from Marrakech before we made it to the sand dunes. Upon arrival we took a sunset stroll atop our dromadaires (one-humped camels) and we sang christmas carols–as it was christmas eve. That night we sat by a huge campfire as our Berber hosts played the drums and sang us traditional Moroccan songs. They taught us to identify constellations under the most magnificent snow globe sky. I saw Taurus for the first time and a slew of shooting stars! 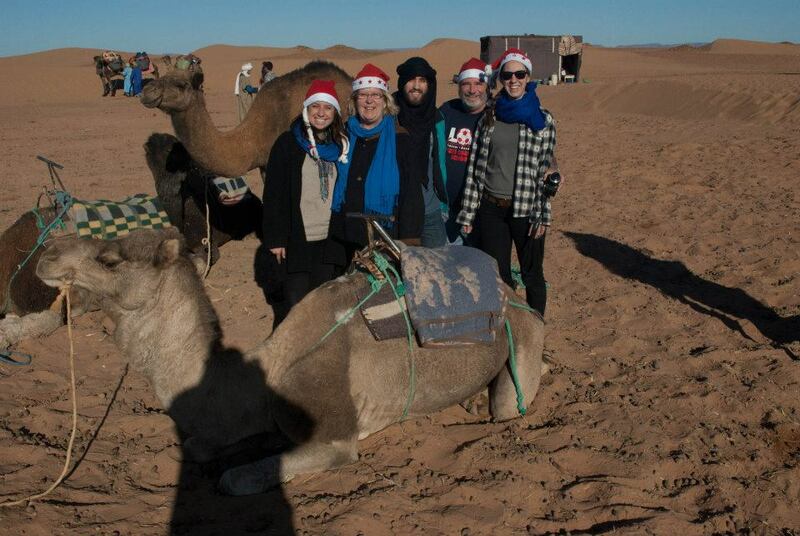 We parted early Christmas morning on camel back heading for more sand dunes. Bigger sand dunes. Enormous orange f-ing sand dunes! 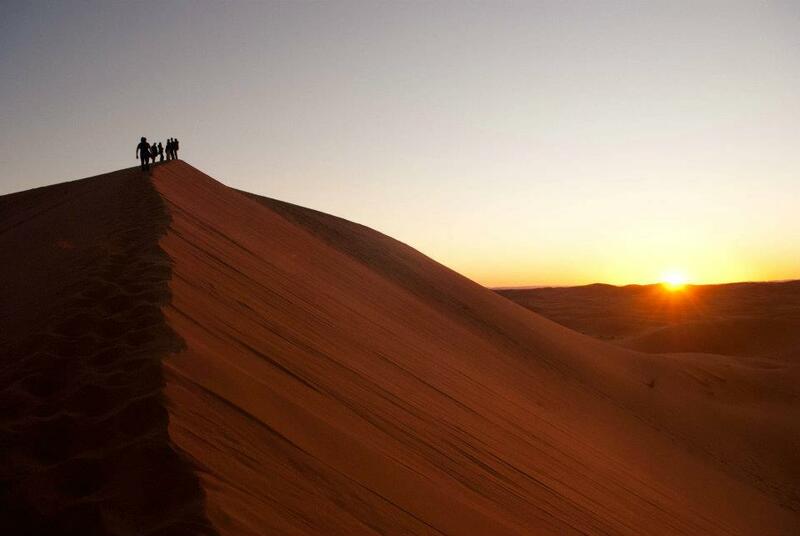 We made it to our next campsite late in the afternoon, and we set out to climb the highest dune we could find. Making it to the top was a magnificent accomplishment and I watched the sunset with a feeling that I was on top of the world. The desert was humbling and powerful; a place where the wind erases your footsteps. Leaving the desert took us a full day of driving (half of it was off-roading) to get back to Marrakech. We met up with a bunch of Kaitlin’s friends in the city for dinner in the tourist trap main square Djemaa el Fna. We ate enough food for 16 people. The next day we spent exploring the medina and buying souvenirs. Then we set up the apartment we had rented for a dinner and a fête. Buying alcohol in Morocco is shooma (shameful)…but it’s a key ingredient to any Locascio party 😉 so we went to the big super market to stock up. We ended the voyage back in Rabat, and the reality of going back to France hit me pretty hard. I felt at ease in Morocco. Not only was I in the best company, but something about the country felt right. For me, Morocco is the perfect mélange of my studies and interests. I loved having the feeling that I was in the “Arab world” while also being able to communicate at any given moment in French. Traces of French Colonial identity are still very prevalent in Morocco and that fascinates me to no end. It was hard for me to leave, but I feel like I’ve been motivated to commence studying here in France. I don’t mean I’m enrolling in school, but I’m starting some projects. It’s been 7 months since I’ve done any sort of research, and I think that it’s about time that I start again. I’m in the perfect place to learn about French-Maghrebian identity politics so I am going to take advantage, while I’m here. As for Morocco, I’ll be back. Insha’allah.